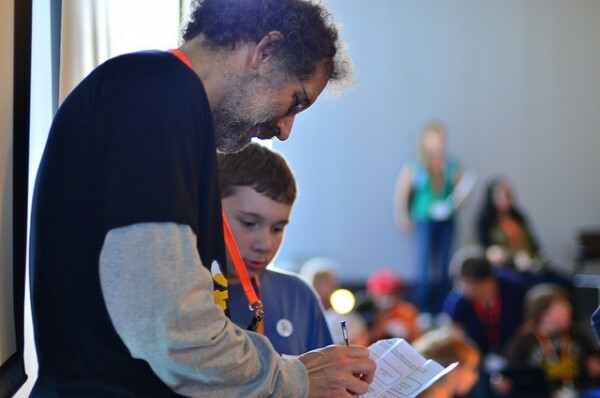 As Professor of Learning Research at the MIT Media Lab, Mitch Resnick channels his own creative intellect to transform classic forms of play into hands-on learning experiences. These new educational technologies, which are thought up by his Lifelong Kindergarten group, are designed to actively engage youth in the creative thinking process. His group’s “programmable brick” technology was the inspiration behind LEGO MindStorms and WeDo Robotics Kits, and his group also developed a user-friendly educational programming language called Scratch, enabling children and teens to create, remix, and share stories, animations and simulations online. He is co-founder of the Computer Clubhouse, a network of after-school learning centers where youth from under-privileged communities explore their interests through the use of technology, and he also heads the Media Lab’s academic Program in Media Arts and Sciences. In August, he was appointed co-director of the newly launched MIT Center for Mobile Learning at the Media Lab serving alongside MIT colleagues Hal Abelson and Eric Klopfer. The three researchers study and explore new mobile technologies and its applications, allowing people to learn at anytime and from anywhere. This past September, he was awarded the 2011 McGraw Prize in Education from the McGraw-Hill Research Foundation for his work in digital education. We spent a few minutes asking Mitch about his various academic roles and what it’s like to be known as a pioneer of creative play in the emergent field of digital media and learning. You’re a believer of promoting construction rather than instruction when working with youth; how does this relate to their ability to think and act creatively? Many would agree that we live in an era of rapid change. Nothing is more important than the ability to think and act creatively because we can’t know exactly what situations we will be experiencing in the future. The best way to prepare for this unsure future that awaits us is to be able to come up with innovative solutions for unexpected situations. We are trying to explore how we can help young people develop as creative thinkers so they will be prepared for tomorrow’s society that will value and require creative thinking more than ever before. When people are engaged in creating things, it helps them develop as creative thinkers. We try to provide a lot of opportunities to design, create, and invent new things. Of course, It’s not just about the act of creating something — it’s part of a process where you start with your imagination, come up with ideas and then you create a prototype so that you can experiment with those ideas and collaborate on creations with others. You can then reflect and think about what you learned from this creation and then form new ideas. That’s what the creative process is all about: the ability to imagine and create and experiment and share and collaborate and reflect and then repeat that whole cycle over and over, revising and improving each time. From where do you draw your inspiration to provide children with engaging tools that stimulate each other through creation? Whenever I’m developing new technologies or activities, I’m always thinking about two types of connections: I want it to connect to the interests and passions of the people who will be using it, and I want it connecting them to new and important ideas. LEGO is a natural partner because many young people already have a passion for building with LEGO material. What we did was add computation to LEGO material so that kids could build not only structures like houses and castles but build things that move, interact, communicate and respond. In doing that, we were connected to young people’s interests but also connected with new ideas. When they built things that moved or responded they learned about how things communicate and respond in the world today. Young people grow up in a world today where they are surrounded by interactive devices. You walk up to a door and it opens automatically, or the sun goes down and the lights come on. We don’t want that to be magic. The best way for them to understand how things like that work is if they get to create things like that themselves. Kids learn about color at a young age when they use crayons and finger-paints. To learn about interactive things in the world, we need to give kids a chance create interactive things the same way they created pictures with crayons and created towers with wooden blocks. Which of your current projects at Lifelong Kindergarten do you foresee having an immediate impact on youth development and learning? We are now working on the next generation of our Scratch software and online community. Scratch enables young people to create their own interactive stories, games and animations and then share their creations with others online. Just last week the Scratch online community got its two-millionth project. 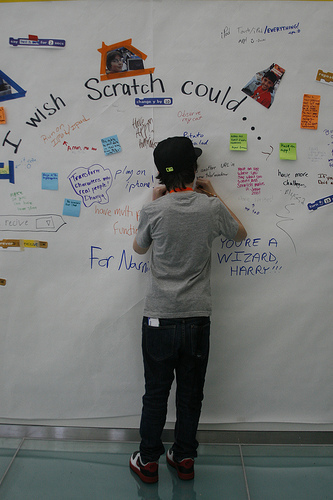 Scratch 2.0 will enable new forms of collaboration and sharing among young people. There are new ways to connect their Scratch activities to other things they do online such as grabbing data from the web and bringing it into their Scratch projects. We see many possibilities open up to help young people learn new ways of collaborating and new computational ideas so they can express themselves through this next generation of Scratch. If we want young people to be active participants in society, they need to be fluent in the use of new technologies. Knowing how to use and interact with new technologies just isn’t enough. Fluency means being able to express yourself. It doesn’t mean everyone is going to grow up to be a computer programmer or scientist. We want everybody to be able to use computational tools to express their ideas in a wide variety of forms. That’s one of our goals. I think our projects such as Scratch and our work with LEGO robotics are all part of that overall effort to help young people become truly fluent and become full and active participants in tomorrow’s society. Whether it’s in their work life, community life or personal life, it’s critically important for them to express themselves through the use of these new media and technologies. What was your reasoning for launching a center for mobile learning now as opposed to in a few years when mobile technology may have a more primary role in an active learning environment? We want to support young people in learning wherever they are — in school or out of school — day or night. One of the appeals of mobile technologies is that it can support learning and activities wherever you are at any time. Now is a good time to be thinking about the possibilities of mobile technologies in the future because they are entering into people’s daily lives. Unfortunately many people are not using mobile technologies for creating and expressing themselves, but instead they’ve been used more for consuming and for communicating with one another. One of our goals is to explore how mobile technologies can support those types of learning experiences that we think are so important where young people are actively designing, creating and developing their own voice so they can share their ideas with the world. One thing to note as we start this center for mobile learning is that we can all learn from one another. The center’s first focus, the App Inventor for Android, pioneered a new direction in letting people develop their own apps. In our work on the Scratch community, we’ve done a lot of thinking about how people can learn from being a part of an extended online community and learn from each other’s creations. Our experience with the Scratch online community could help provide some guidance for ways to build a community of users for App Inventor where they can share and build upon one another’s creations. What was your favorite toy growing up that made you fall in love with the idea of play? What was most important to me was when I was creating my own toys and games. I remember that my parents were tolerant enough to allow me to dig up our backyard so that I could make my own miniature golf course. During that process, I learned all types of things. I learned how to make walls steady and how balls would ricochet off the wall. When I first put a hole in the ground it wasn’t sturdy, so I learned how I could put a can in the ground to make it sturdier. But then when it rained it filled up with water, so I learned how to cut out the bottom of the can to let the water drain out. The process of making things has not only allowed me to play games, like miniature golf, but creating the course allowed me to learn the skills of making things and, more importantly, I learned about the creative process and the design process as a whole.